English Fireplaces never forget that the fireplace is the central defining point of the room. We offer a full range of hand carved marble, limestone and sandstone fireplaces that combines the finest quality with great value. Our team is experienced, friendly and knowledgeable - completely committed to offering you a service unrivalled in the fireplace industry. We guide you from your initial enquiry through the whole range of design considerations and technical constraints to overseeing the final installation of your fireplaces. You can trust our guarantee of 100% satisfaction. The fireplaces you see in our projects are hand carved from purely natural materials to produce pieces of great elegance and beauty. Whether our master masons are creating authentic replicas of period designs or something far more contemporary, they are utilising crafts and techniques first developed in fireplace creation during the 17th and 18th centuries. Timeless skills creating contemporary classics. 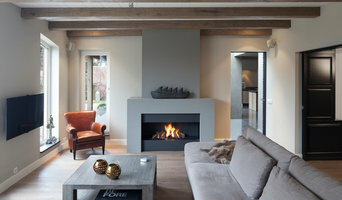 For more than 26 years, Modus Fireplaces has been at the forefront of the modern fireplace industry. We create bespoke fireplaces for the UK’s most prestigious homes and hotels, as well as collaborating with world renowned architects and designers. Our overriding ethos is that a fireplace should not be viewed simply as a “fireplace” but as a year round piece of beautifully sculpted furniture providing maximum impact and a cosy, relaxing ambiance. Working all over the UK and abroad, we offer an unsurpassed design to installation service, working closely with clients, designers and architects to ensure stunning results. Chesney’s is established as the UK’s leading supplier of luxury fireplaces and stoves. Our company’s success has been based on a passionate commitment to good design, intelligent engineering, craftsmanship, innovation and outstanding service. Paloform designs and manufactures outdoor fire pits, fireplace surrounds and tile using concrete, Corten, stainless steel and powder-coated metals. Our products are handmade in Canada and are the result of over twenty years of experimentation, refinement and heavy lifting. We believe that good design subtly and continuously informs our well-being and this belief fuels our drive to create well-designed products that transform and inspire the spaces that we inhabit. We are proud to be able to offer our products Europe-wide with third-party certification to CE standards under the Gas Appliance Directive. Stove, Gas Fire & Cooking Range showroom in Takeley, Essex. Welcome to Orion Heating, specialists in Woodburning and Multifuel Stoves, Feature Gas Fires, Fireplaces and Cooking Ranges We are an established family business in operation since 1977. Our aim is to supply home owners in Bishops Stortford, Saffron Walden, Stansted Mountfitchet, Great Dunmow, Harlow, Cambridge, Braintree and the surrounding villages with good advice, quality woodburning stoves and efficient gas fires. Our values have not changed in nearly 40 years, but our range of products has expanded to include gas stoves and gas fires, cooking ranges and forestry equipment. 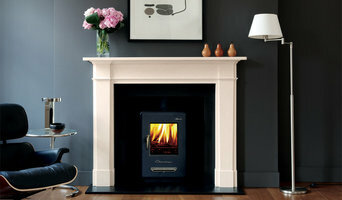 At Dulwich Fires we supply, install and maintain DEFRA, multi fuel and wood burning stoves. We are a local established business serving London and the South East. With many years’ experience installing stoves. Our installation service is carried out by fully HETAS qualified engineers and complete customer satisfaction is guaranteed. We specialise in original, antique fireplaces, antique fire surrounds and fire inserts. 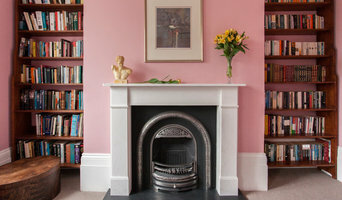 Our extensive range includes hundreds of original fireplaces from the Georgian, Regency, Victorian and Edwardian eras including Gothic, Arts & Crafts, Art Deco and Art Nouveau styles, in all materials including cast iron, marble, stone, wood and slate. We offer friendly, expert advice on the whole process and can recommend trusted specialists for fitting. The Architectural Forum is also home to a wide selection of original, reclaimed, cast iron radiators. All our antique radiators radiators come fully restored, and can be polished, or painted any shade. Get in touch to discuss exactly what size and style would best suit your space. Our extensive range of architectural salvage includes old bricks and reclaimed bricks, yellow stock bricks, reclaimed floorboards and flagstones and antique doors. Contact us to find out if we have what you're looking for. We have salvaged items from a number of notable London buildings, including the Tower of London, Commonwealth Institute, Royal College of Surgeons, Tate Gallery, Baltic Exchange, Harvey Nichols and many other prestigious buildings. We serve several famous, private customers and corporate clients such as All Saints, Ralph Lauren, Superdry, Jack Wills, Wild Wood, Alfred Dunhill, Jamie's Italian, Pizza East, Selfridges and Paul Smith. The Architectural Forum has been featured in many books and appeared on TV several times, find out more on our About Us page. Architectural Forum is a regular exhibitor at the annual Salvo Fair and is a Salvo Code supporter. We have a beautiful wood stove showroom in Rochester where we carry a range of traditional, contemporary and ultra modern wood burning stoves in a variety of colours. We are also HETAS registered installers. We have hand picked our log burners and multifuel stoves from some of the industry's highest quality manufacturers. We are the official local retailer for Charnwood, Jotul, Hwam, Scan, Nestor Martin and Future Fires. Between these six manufacturers we can offer a complete range of styles, from the small and pretty Jotul F100 to the large and strikingly modern Scan 83 in bright white (full list of showroom products below). You can also view examples of the fireplace designs we can create as part of our installation packages. On display we have stunning fireplace surrounds, granite and slate hearths, brick finish fireplaces, faux wooden beams and decorative heat shield panels. We are a family run business in Islington since 1976. We have a large showroom with Georgian, Victorian and Edwardian fireplaces and also more contemporary designs. With a comprehensive service, from advice on styles, site surveys and professional installation, our years of experience mean you can certainly count on us for a high quality and better hearth. Thank you for visiting Install My Fireplace. We are based in South East London and cater to the London plus North Kent areas. We have an experienced team with many contacts in the industry enabling us to offer an ultra competitive sourcing and installation of fireplaces,stoves and flue liners. Let us know what you need and we will find it for you, matching price. We offer a free site survey to give you an idea on the fireplace which will fit best and make sure your flue is in working order. Our work is carried out to the highest of finishes making sure that we cover every last minor detail from start to finish. Here at Install My Fireplace, not only do we supply we also design and install your fireplace for you. We have an experienced team with many contacts in the industry which combined with our low overheads as a online business, enabling us to offer an ultra competitive price on the sourcing and installation of fireplaces,stoves and flue liners. As we are an online business, we do not have a show room, but we bring our shop to your home. We have 14 years experience in the industry making us very knowledgeable in helping you choose the right stove and fireplace for your home. Jamb Ltd, founded and created by Will Fisher, one of London’s most highly regarded antique dealers, has established an unrivalled reputation in the UK and worldwide for dealing in superior quality antique fireplaces, including rare 17th century, Georgian and Regency mantelpieces. Jamb creates the finest marble and stone reproduction fireplaces, reproduction antique lighting and furniture, ensuring the highest quality of design and craftsmanship. Founded by architect Henry Harrison in 1984, his Geolog fire was the first gas fire designed for modern interiors. Since then he has continued to innovate, creating contemporary designs that reinstate the fireplace as the central focus of the modern residence. As pioneers of the modern gas fireplace the company has unparalleled skills in producing custom solutions to projects from detailed burner design to flue systems. Over the last 30 years we have worked over several continents with many of the leading architects and designers in the UK specialising in bespoke one-off gas fireplaces. What are the key differences between fireplaces, wood-burning stoves, electric fires, flueless gas fires and the rest? Some fuels burn more efficiently than others in certain conditions. But it is also about the ambience that different fireplaces and stoves can create. If your chimney is functioning and the flue is in good working order then you might prefer a traditional wood-burning stove, log-burning stove or Victorian fireplace for your period property or cottage. Combined with a marble or stone fire surround, the latter will add a rarified sense of grandeur to any dining room or lounge, but it does take a while to get going. Ventilation is also an important consideration, as is practicality. You’ll be clearing away ash on a regular basis. First thing’s first though: check with your Grange Hill, Essex authority to see if you live in a Smoke Control Area – fireplace installation specialists in Grange Hill, Essex may also know this. Compact freestanding stoves, either multi-fuel, gas, oil or electric, have become very popular in recent years as homeowners try to rekindle the open-fire romance of yesteryear. But if efficiency, lower energy bills and fuss-free heating are more important, a gas fire scores highly, particularly the flueless gas fire variety, which draws waste gases out through a duct. You will also have much better control of the temperature. That said, the gold standard of sustainable heating and performance is the bioethanol fireplace – smoke-free, odourless and not a speck of ash to be seen. Meanwhile, fans of sleek and minimal design will melt away at the sight of a hole in the wall gas fire. These preserve valuable floor space, will comfortably heat a small living room and come in a variety of beguiling forms – a fire ribbon row of flames, a fire bowl or fire basket with pebbles. It’s like magic. Ask your fireplace installation expert in Grange Hill, Essex or local showroom to show you all of the different types so you can clearly see the difference. When considering your options, talk with your fireplace installation specialist in Grange Hill, Essex about the size of area you wish to heat, the current sources of heat (such as central heating), potential heat loss (through windows, for example) and degree of insulation. If your home is modern or well insulated it probably makes sense to choose a fireplace, fire or stove that works efficiently on a low setting to avoid over heating! 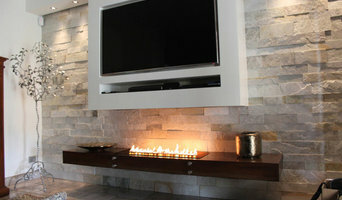 Where can I find the best fireplaces, specialist fireplace showrooms and fireplace installation in Grange Hill, Essex? Search on Houzz for Grange Hill fireplace experts and showrooms in the Find a Pro category and then start collecting your favourite images in an Ideabook. Contact your preferred company for a free consultation in their showroom or at home. Many will be able to offer a comprehensive service, from consultation and bespoke design to installation and aftercare. Don’t run straight to the cheapest. Build up your knowledge and balance price with quality of design and service. Are your installers HETAS and/or CORGI approved? Are your products CE approved? Can you offer a free, no-obligation consultation at my house? Where can I read feedback from other customers who have undertaken a similar job? How will your fireplace or stove recommendation affect my energy bills? Is your quote inclusive of all parts, delivery, labour and installation? How much disruption and mess will this cause? How much maintenance and cleaning is required? Is your work covered under warranty? Do you have public liability insurance and employers’ liability insurance? Do you offer me a discounted rate to customers for servicing? Search for fireplace showrooms and specialists that offer fireplace installation in Grange Hill, Essex on Houzz and see past projects, photos and reviews in order to find the best fireplace and professional.